A router is an electronic device that is used to connect two or more networks so that information can be passed among them. They are very popular for setting up internet connections among several computers. There are wired and wireless routers but they both work the same way. Networks that mostly use a router for connections are Local Area Networks (LANs) and Wide Area Networks (WANs). Computers on the internet use a special modem which translates digital signals into data that the computer can understand and use to communicate with other computers on the internet. A Digital Subscriber Line (DSL) is commonly used to connect computer to the internet via telephone service using a DSL modem. 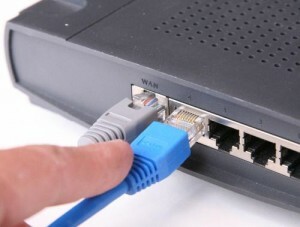 A typical modem usually has just one Ethernet connection port; therefore, for other computers to be connected to the network, a router has to be used to make the connection. Take telephone cable and plug one end into telephone jack. Plug the other end into the telephone port on the DSL Modem. Take category-5 network cable and plug one end into the network port of the modem. Plug the modem’s power cable into an electric outlet. Plug the other end into the port marked “uplink” port on the router. If there is no uplink port, plug into port marked Port 1. Take the next category-5 network cable into the network adapter card on the computer. Plug the other end of the same cable into one of the available ports on the router. Do not plug this cable into Port 1 or the uplink port. Plug the router’s power cable into electric outlet. Take a look at the modem to make sure that the lights marked “Connection”, “Activity” and “Traffic” are blinking. Check the router also. The uplink light and the computer connection light should be on or blinking. You should also have lights indicating “Connection”, “Activity” and “Traffic”. As long as all these lights, both on the modem and on the router are flashing it means that the router was connected properly to the DSL modem. If the light indicating “Activity” is blinking on the modem but not on the router, the connection is faulty and needs to be checked out. The most common reason for this is a faulty or loose cable. All you have to do is replace the cable with a new one.